Ventilation — O'Day Mariner #1922 "Orion"
Orion is a damp boat. There's a leak through the centerboard case into the cabin I'm still trying to track down, there's water in the flotation and I'm still trying to solve the problem of a totally leak-proof centerboard bolt without having to go crazy with 3M 5200. It takes a long time for mildew to form, but I never like to open the cabin hatch and find a lot of stale air inside with water droplets still on cushions from a week before. It was time to address getting proper ventilation into the cabin. Solar Power: Active or Passive? 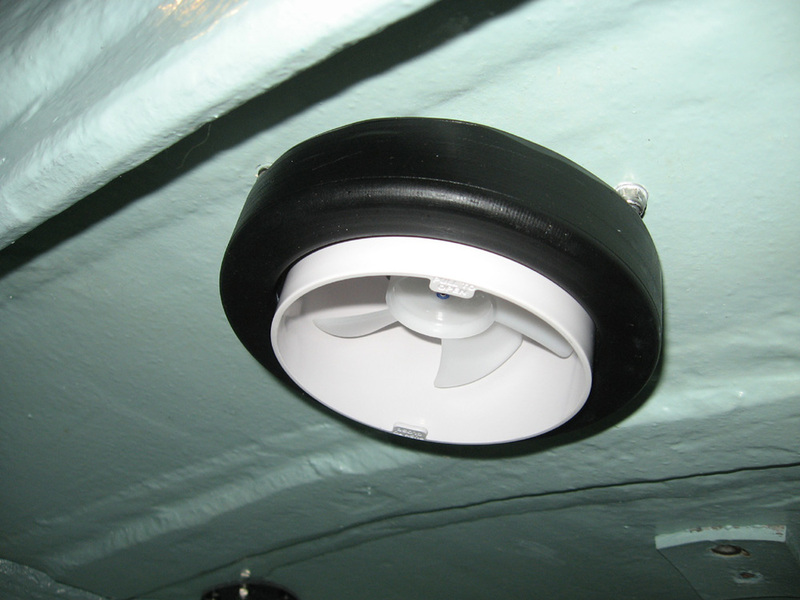 I had already told myself I was going to get a solar-powered vent to put somewhere on the boat. But I had to decide whether I wanted active ventilation or passiveventilation. Active vents force air down into (or out of) the boat, whether they are solar-powered or hooked up to a boat's battery. Passive vents are totally dependent on wind movement - the wind, rushing over a passive vent, is what turns the fan. I didn't like the idea of a passive vent, since if there is no wind, there is no ventilation. There are active/passive combination vents, where a solar-powered fan runs during the day and lets passive air take over at night. I didn't like that idea, as many times the wind stops during the night. I wanted constant ventilation - call me greedy, but that's that. An active vent it was. And since I don't have a battery onboard Orion, the solar power would have to suffice for both day and night. After looking at several models, I chose the Nicro Day/Night PLUS vent. Nicro has been around since the 1960's, and they know a thing or two about ventilation systems. The solar charge from the day was supposed to last a whole night, and even beyond with a complete charge. Several Mariner owners already own one and swear by them, including Rich Weston (#2290 Sweet Caroline) who wrote to me: "I have the Day/Night solar vent. It has been running strong for at least seven years. It's great for keeping out mildew. When it gets a full charge... the fan will run the entire night on the day's charge. So my fan runs 24/7 in the summer." I read other reviews that mentioned Nicro replaced their vents quickly and for free if they seized up. With all this information, I was sold! Believe it or not, I agonized over where to put it almost more than I did choosing the darn thing. Most boats, Mariners or otherwise, put their vents on their forward hatch, which makes a lot of sense. However, I had custom-ordered my forward hatch to be translucent, and I was darned if I was going to drill a hole through that and lose some of that light. Plus, I didn't think I was going to like the look of a vent protruding from the hatch, either from underneath or on top. So I looked at the cabin deck. That was a no-go, since there wasn't anyplace in the centerline of the deck where I wouldn't run into some deck/mast tabernacle reinforcement underneath, and I wouldn't compromise that. I couldn't put the vent off-centered, because that would simply drive me crazy. I finally decided to put it on the foredeck, as close to the cabin front as I could. With the roller-furling jib, I rarely go up on the foredeck anymore, but I did want a place to stand when dealing with the anchor. I found the perfect spot between two deck-reinforcement "ribs". After marking where I wanted it, I took a deep breath and drilled a 4 1/2" hole through the deck. I hate putting holes anywhere, and I had to pace back and forth for a few minutes before working up the nerve - this was a big hole. Although the Nicro instructions actually called for a 4 3/4" hole, I found that was only necessary if installing a trim ring, something I planned to skip. A 4 1/2" hole was plenty big enough, so that's what I did. Taking the top off of the base plate, I positioned the base plate where I wanted it and drilled the three holes that would hold the base to the deck - first starting with a 5/32" drill bit and then enlarging the holes to a recommended 7/32". Instead of using the supplied screws (that would screw into a thicker deck), I went with 1" 10-24 machine screws with locknuts. After putting a 1/4" wide bead of 5200 around the upside-down base plate (making sure to go around the machine screw holes as well), I also put a bead around the hole itself. In my mind, you cannot use too much sealant when it comes to keeping water out of your boat. From there, I flipped the base plate right-side up, carefully positioned it over the holes, and set it down. I put a small ring of 5200 underneath the three machine screw heads to make sure no water would weep its way down the threads, and then I put them in and tightened them with washers and locknuts - I was able to reach both sides of the vent by sitting on the V-berth with my head and one arm sticking out of the forward hatch. It was important not to tighten them too tightly - the plastic could break if I really put my weight into it. Also, the vent tightened and slightly bent over the slight curvature of the deck might actually impede the fan from running. After that, I attached the top of the vent itself. That part was done! Here is what it looks like on the inside. If I wanted to, I could actually leave it that way, but I wanted to dress it up a little bit. Since I skipped the interior trim ring option (there was not enough room for it to fit properly by that deck stiffener), I was able to buy a soft vinyl protective ring (made by Nicro) to go over the protruding portion. While the ring could not slide all the way up to the top because of the machine screws, it does at least cover them up to some degree and make the whole thing look a little more presentable. Besides, who is actually going to see it? So, there you have it. The whole process took me about an hour and a half, although I really took my time and worked slowly. If I didn't have time to waste, I am sure I would have been able to do everything in almost half an hour. The manual recommends having some kind of intake vent (like a clamshell vent) somewhere in the back of the boat to facilitate the passage of air, but Orion isn't very airtight, and it hasn't been a problem. Unfortunately, as soon as Orion was taken out of the garage at the beginning of April, the battery wasn't working. After many phone calls and e-mails to the Nicro company (owned by Marinco) which spanned several months, they finally shipped a new battery and everything worked properly. As much as I like the Nicro vent I chose, their customer service needs a lot of help. That being said, I'm quite pleased with the vent's performance as it seems to be doing its job circulating air into the cabin. In the past, water droplets would have remained on cockpit cushions placed inside the cabin until the next week when I would go sailing again. They now seem to be dry by the time I get to the boat after a week, so I'm pleased with that. It does get in the way a little when I'm working with the anchor or mooring line, but I now make a point of "squatting" over it when I'm working up forward so I don't accidentally step on it. All in all, I'm satisfied with the product, although since the installation, I've had to replace the vent with a new one and replace the battery at least three times. The cost adds up, but the ventilation it provides has been very beneficial. And yes, that is a fake cow in the background. It's my father-in-law's. He lets me keep my boat is one of his garage bays all winter, so I don't ask too many questions.